After reading the very intense Extremely Loud and Incredibly Close, I looked for a light-hearted love story – but apparently I didn’t read the description of Eleanor Oliphant is Completely Fine carefully. Neverthless, I’m happy about the oversight. Eleanor’s pretentious and witty attitude makes for a really funny and interesting character. Her rigid behavior acts ask both comical relief and and insight to the depth of her state of mind and past. I really appreciate the complexity of her personality. She’s funny and silly about romance, but at the same time she deals with an impossible mother, resulting in substance abuse and depression. I think the many facets of her personality are something many can relate to – a girl who splurges on a new look from “Bobbi Brown” excited about the prospect of meeting a cute musician could very well be the same girl who binge drinks herself into a suicidal state all within a week. I also absolutely love Eleanor’s new and unlikely friend Raymond. Genuine and easy-going, Raymond is the kind of person I’d want to have as a friend too. It seems so important, considering Eleanor’s life, for her to meet a truly kind person. There’s comfort in a friend that understands the level of complexity of your past without needing all the details. Raymond gives Eleanor that space, but it doesn’t affect their friendship. Raymond also makes it easy for Eleanor to make new friends, another good trait to have in a loved one. A love story of a different kind doesn’t come around as often as it should. This one is worth the read. 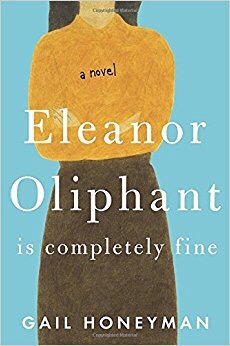 I listened to Eleanor Oliphant is Completely Fine on Audible, also available at other bookstores.